Tea Room at Erwood Station Gallery01982 560674work Tea/Coffee ShopErwood Gallery Tea Room providing wonderful homemade cakes and tea within an inspirational gallery setting. Tea, locally-roasted coffee & award-winning gluton free cakes. 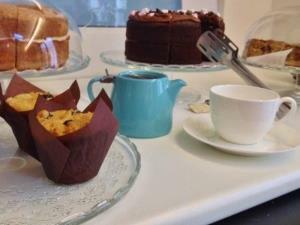 Erwood Gallery Tea Room providing wonderful homemade cakes and tea within an inspirational gallery setting. Tea, locally-roasted coffee & award-winning gluton free cakes. The gallery includes two thousand square feet of exhibition space housed within a railway station and vintage carriages, and is the largest privately owned contemporary applied arts gallery in Wales. Exhibits include paintings and sculpture and four seasonal exhibitions a year. There is a small self service tea room serving hot and cold drinks and cakes (no lunches), a picnic area, and walks along the river and into the surrounding hills.